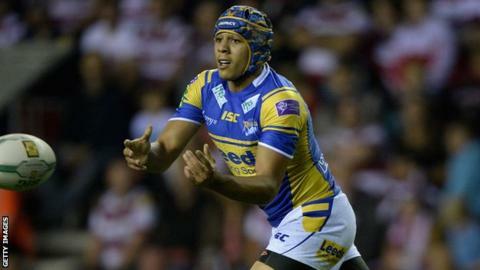 Leeds have confirmed that full-back or winger Ben Jones-Bishop will leave the club at the end of the season. The 25-year-old came through the club's academy, making his debut in 2008 and has scored 53 tries in 76 games. He played in the 2011 and 2012 Grand Final wins, as well as the World Club Challenge success in 2012. "It will be sad for me to leave. It was a big decision to reject the offer of a longer contract last year, but I wanted to keep my options open," he said. "I will miss the Rhinos players and fans but they can be assured I want to finish my time here on a high and I will be trying my best to contribute to that success in any way I can." Jones-Bishop, who was sidelined for six months last year because of a blood clot, lost his place to new recruit Tom Briscoe at the start of the season and has struggled to get a place in the Super League leaders' team, although he scored two tries in Thursday's 22-14 win over Castleford. Head coach Brian McDermott added: "Ben has shown what a complete professional he is this season with his attitude and commitment to the team through what has obviously been a frustrating period for him personally. "He remains one of the best young English players in our competition and he has shown, when called upon this season that he is a clinical finisher of chances. "It will be sad to see him go at the end of the season but he will go with all our best wishes and I know he will have a big part still to play in this season for the Rhinos."